This title is available for Pre Order. We have an expected release date, but this is liable to change without notice. If you order this game, along with other instock titles, your entire order will ship when the Pre Order games come into stock. Penny Lane is a worker placement game for 2-5 players in which players compete to build the most prosperous city avenue. You can build residences, shops like the Confectioners, and attractions like the Penny Arcade! You'll also need to employ citizens to generate income for your lane. 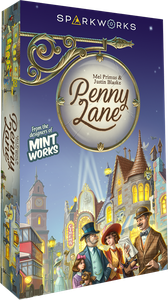 Penny Lane also has a tableau-building component, where players can get bonus points or currency by aligning their buildings with different "links."